Declawed cats are from random veterinary practices in America that were posted by veterinary professionals or cat owners. 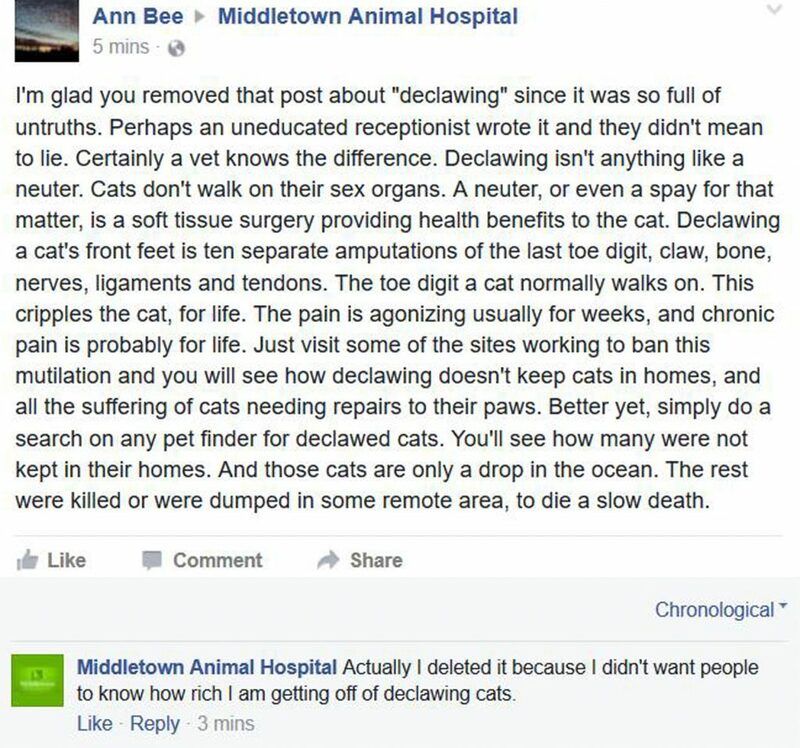 We need to remind these unethical veterinary folk$, who took an oath to just HEAL and HELP animals, that there are thousands of declawed cats that are in shelters/rescues who were thrown away by their owners because of behavioral issues that were cause by the declawing. 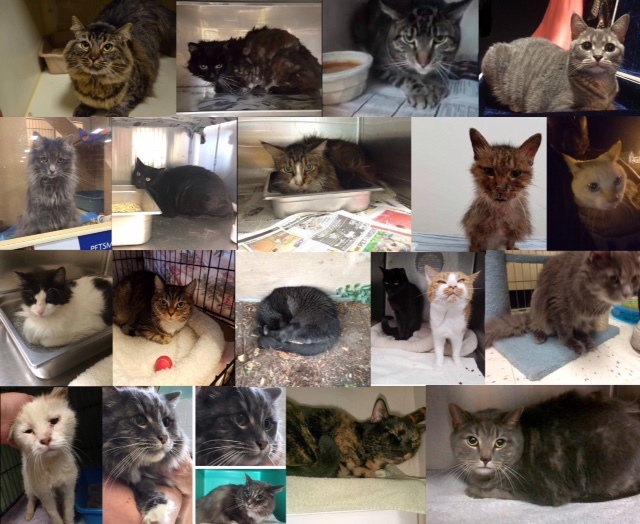 Here are faces of some of the many DECLAWED cats in shelters who will be euthanized if they can’t find new homes!!!!!!! Many of these thousands of declawed cats in shelters are euthanized as a result of being declawed! 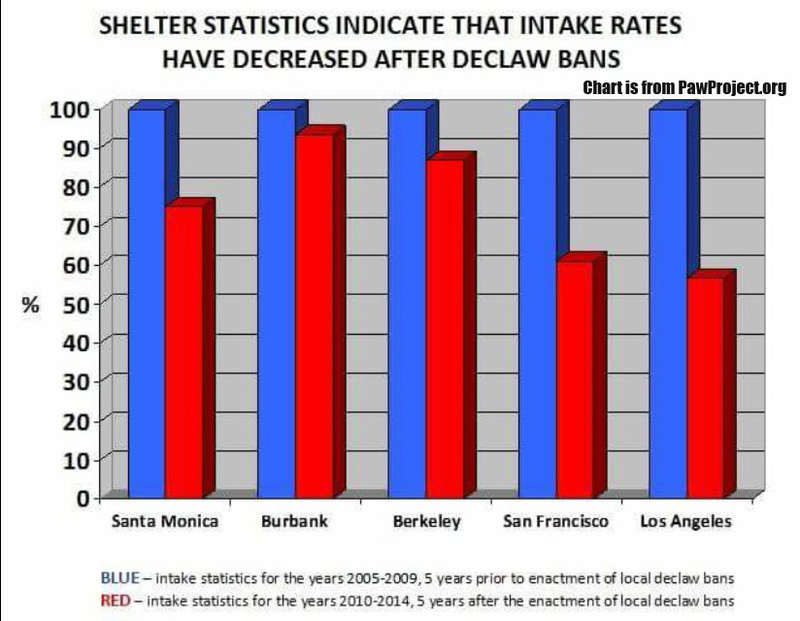 Also we must remind the public about these FACTS that show that in the cities in California where declawing was banned, the intake of cats in shelters went DOWN! These NJVMA veterinary professionals are doing anything they can to try to stop our cat protection bill so that they can keep declawing cats and it is so very wrong. 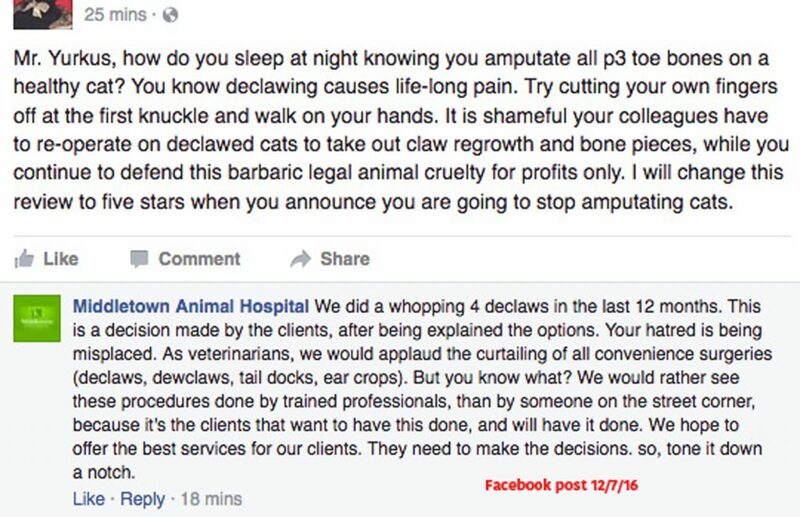 Instead of paying a pr firm for lobbying and this unethical campaign like this one, they could be using it to educate the public (instead of deceiving them) about how declawing is inhumane and mutilating for their cats, and educate them on the humane alternatives to this very barbaric and unnecessary procedure. Remind them that the world is watching and not happy with this very unethical “Love Your Cats” campaign. 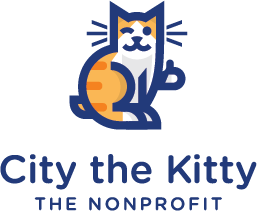 Mutilating a cat in a very painful procedure that ALWAYS causes long term negative consequences for any cat. You would think that we are in this fight and up against very misguided human beings who support animal cruelty and torture, and not veterinarians who are supposed to be true advocates for animals by thinking of the animal’s needs first. These people, who are the only ones in the way of ending this dark and evil chapter in the American veterinary profession, are “doctors” who are supposed to be, first and foremost, here to HEAL all animals, and not sadistically chop, slice, or burn off their much needed body parts for the welfare of a piece of furniture or other such lame and weak excuses. Especially when there are ALWAYS humane alternatives. Veterinarians in the rest of the world are simply shocked and appalled that around 80% of vets in America do this mutilating procedure. How could so many of them have lost the main purpose of their noble profe$$ion? You can’t unconditionally love a cat when you barbarically have its toe bones and claws amputated for goodness sake!!! WE MUST PASS THIS BILL IN NJ AND STOP THESE VETS FROM EVER HARMING ANYMORE CATS BY DOING THIS INHUMANE PROCEDURE TO THEM. That’s probably because the vets who sent in their info were the ones who are only doing a few each year. The ones who do them all the time probably didn’t want to participate in their study and reveal how many they are doing to the legislators! 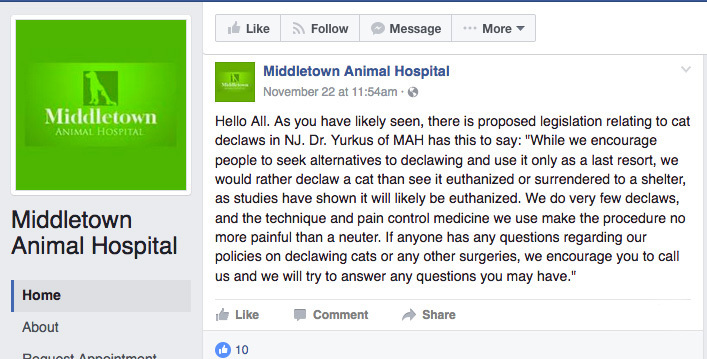 Also, Yurkus’ practice, Middletown Animal Hospital in NJ, recently wrote on a fb posts that they have done 4 declaws in the last 4 months and also 4 declaws this year. If they aren’t being truthful with this example then how can anyone believe anything else they say? 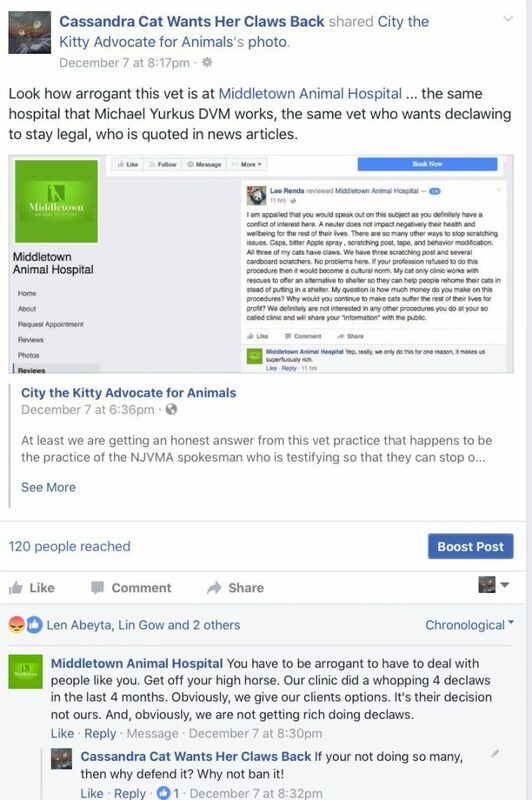 Another post from this practice with the initial comment that talked about the bill in NJ and they even compared the pain in neutering to declawing just as the NJVMA vet, Dr Yurkus, who works at this practice said in the testimony to the NJ legislators. Shocking to say the least on that statement. “THAN BY SOMEONE ON THE STREET CORNER” ? IF YOU ASK THESE SAME VETS TO DECLAW YOU DOG IF IT’S SCRATCHING YOUR NEW HARDWOOD FLOORS OR REMOVE ITS TEETH IF IT’S CHEWING UP ALL YOUR SHOES THEY WON’T DO IT. EVEN IF YOU SAY YOU ARE GOING TO TAKE IT TO A SHELTER OR HAVE IT EUTHANIZED, THESE VETS WON’T DO THOSE PROCEDURES TO YOUR DOG. SO WHY TO THEY ACQUIESCE TO CAT OWNER$ WHO ASK TO GET THEIR CAT’S TOE BONES AND CLAWS AMPUTATED?? 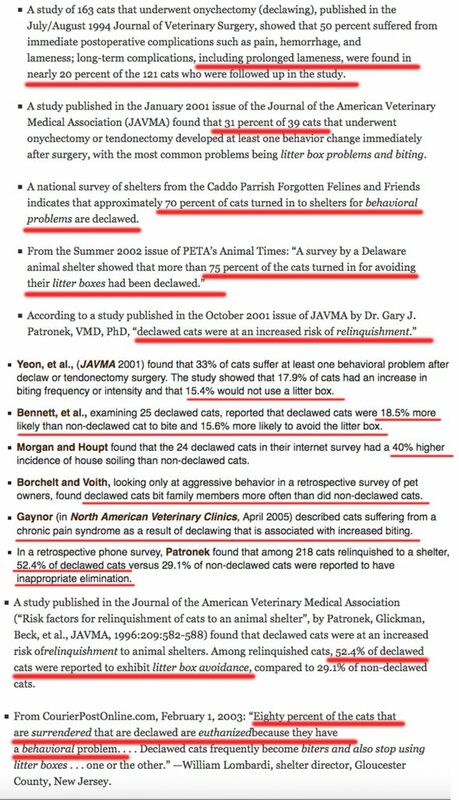 Here are studies that the NJVMA doesn’t want people to know about.